Blog Will humanity survive AI? For people who follow my blogs, they know I am interested in the future. Recently, I had the pleasure of interviewing the Gennady Stolyarov, the chairman of the U.S. Transhumanist Party, at the 2018 RAADfest. The interview is a lively discussion of the ambitions of the party to improve the human condition and is well worth a view. People will become increasingly robotic as they defer to their devices and the cloud over their own memory and intuition. AI is a nascent false deity. It uses brute force and massive data mining to create models that mere humans don’t feel they can question. In the computer science field, the Turing Test is named for Alan Turing, the computer scientist who posited a standard that AI should be able to respond in ways that make it indistinguishable from humans. From my experience with Sophia the Robot and AiGO, I can tell you that the latter is closer but that no machine will ever be able to actually become human-like enough to pass my Turing test. I think the future of AI is not about the Turing test but rather the “Hal Test”. Remember in 2001: A Space Odysssey, the HAL9000 computer deemed the crew to be irrational and expendable? 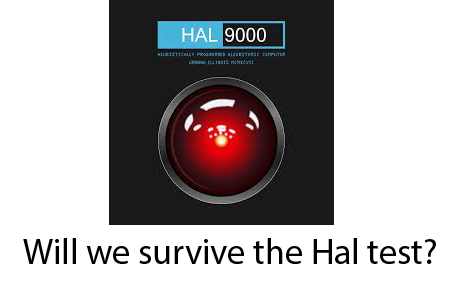 I believe that in the near future we will all acquiesce to the Hal Test and we will all be deemed to fail. Hal will find out that we are illogical, unreliable, self-destructive, and amoral and therefore act, with the authority granted by us, to regulate us. Some will be better at others at getting higher scores on the Hal Test, but in the end, what makes us so charming is what will render us obsolete. So there we have it. The subjugation and dehumanization of humanity will occur because we are loathe to turn off our smart phones, question brute force AI, demand transparency into corporate and government partnerships, and forget to smile and listen to one another. Since the Chinese apparently hacked all of our servers with a clandestine chip, you can be sure that your social credit score will be easily calculable by whomever wants to control you. If you don’t think everyone is being recorded all the time, ask the current defendants in the FISA warrant that are being exposed. Ask Hillary Clinton, whose emails were archived despite trying to destroy devices with hammers. And ask the Saudi Consulate in Turkey which inadvertently live-streamed a heinous political assassination via the victim’s iWatch this week. For those who doubt the extent to which we have already lost out freedom, watch this recent interview from Julian Assange, who is in poor health, warning that this is the last human generation to even know freedom.